Unknown, Krishna Storms the Citadel of Narakasura (detail) (S India, Mysore workshop, c 1840), double page from the manuscript of the Bhagavata Purana, opaque watercolour and gold on paper, 25 x 36.84 cm (spread), Sand Diego Museum of Art, San Diego, CA. Wikimedia Commons. Perhaps, like me, you have long been fascinated by paintings from the Indian sub-continent, but have been afraid to ask for more understanding. If so, this book is aimed at you (and me). The smattering of information which I had gained was bewildering. In the one admittedly large area, there seemed to have been so many very different schools of painting, styles and periods, that trying to make any sense out of it was too difficult. I felt that I needed a guide: someone with sufficient experience, real wisdom, and insight, to get me started. If anyone might fulfil that role, B N Goswamy should. Probably the foremost scholar of Indian painting in the world, he has extensive experience of bringing the works which he knows so well to a wide range of audiences, including those in the USA and Europe. This book was first published in India in 2014, and has apparently already proved a great success in its home market. The book is divided into two main sections: in the first 120 pages or so, Goswamy introduces the reader to the subject, following which each of 101 carefully chosen Great Works is illustrated, described, and discussed. In practical terms, I think most readers will find it best to read the introductory section at a single sitting, digest it a little, then dip into the great works whenever they have a moment. 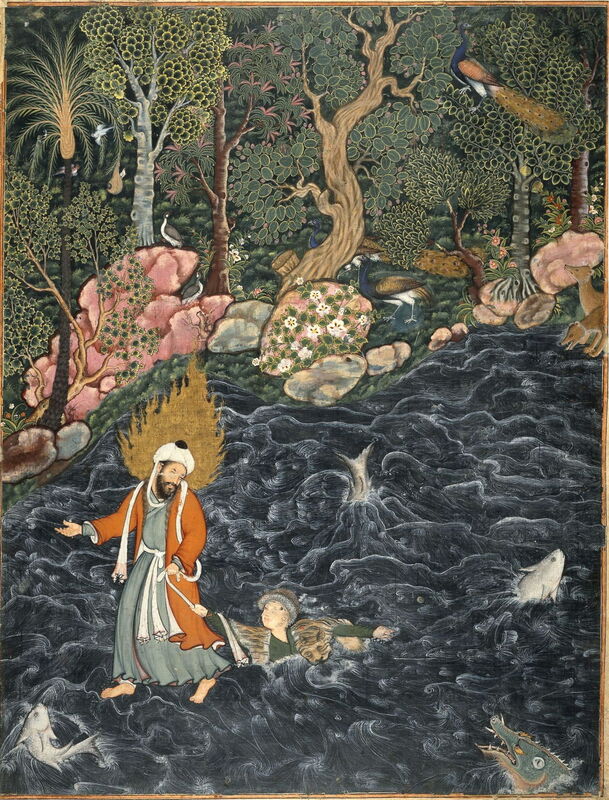 Unknown, The Prophet Ilyas Rescues a Prince (Mughal, c 1567-72), folio from The Hamzanama Manuscript, 67.4 x 51.3 cm, The British Museum, London. Wikimedia Commons. The opening essay, titled A Layered World, is a delightful read, and full of the insight which you would hope of such an expert. He establishes at the outset that he aims to help the reader learn how to read an Indian painting, and explains that using an example of a fourteenth century bronze sculpture before taking us through some paintings. Goswamy brings each topic to life with a series of delightful stories from the history of Indian painting, which here lead into a discussion of the key concept of rasa: a difficult concept which he explains clearly before considering the nine well-known rasas, and moves on to explain accepted conventions about representation, perspective, and the like. 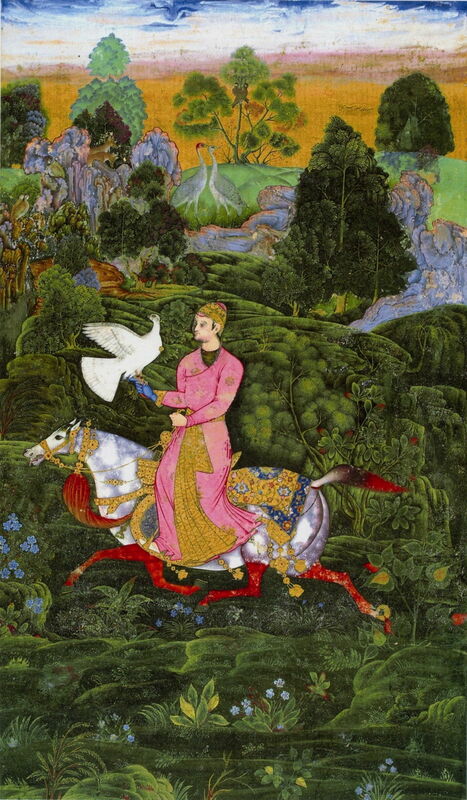 Farrukh Beg, Ibrahim Adil Shah Hawking (Deccan, Bijapur, c 1590-95), opaque watercolour on paper, 28.7 x 15.6 cm, Russian Academy of Sciences, Saint Petersburg. Wikimedia Commons. The difficulty when dealing with so many different schools and styles, such as Mughal and Rajasthani, is to avoid giving an account which is fractured and confusing. Goswamy has the wisdom and mastery of his subject to treat each topic synthetically, so the reader comes away with clear concepts rather than misremembered lists of differences. He explains how the great majority of Indian paintings have become known as ‘miniatures’, in practice an inappropriate label for what were usually folios of paintings on paper which were intended to be read close, rather than hung on a wall and viewed from a distance. He then considers some of the practical issues about brushes and pigments, and provides a helpful composite image showing how an example painting was created in its different stages. He concludes this essay with a lively summary of the major regional schools, styles, and periods, from the twelfth century up to the end of the nineteenth century. This contains mainly sparkling jewels of stories, set in his deep and broad insight. 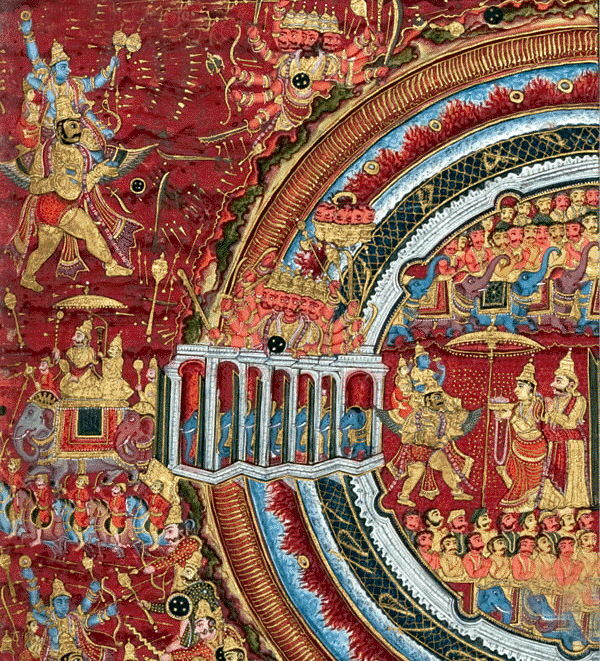 Unknown member of the Manaku-Nainsukh family, The House of the Pandavas is Set on Fire (Pahari, c 1765), folio from Bhagavata Purana series, opaque watercolour and gold on paper, 29.5 x 41 cm, Museum Rietberg, Zurich. Wikimedia Commons. The Great Works themselves are grouped by theme, into Visions, Observation, Passion, and Contemplation. Although to the Western mind accustomed to thinking in genres this might at first seem vague, it works well and I never found myself wondering why one painting was here rather than somewhere else. Most paintings are covered in the course of four pages: the first shows the painting itself, the text is headed by the full details, with a brief introduction to orientate the reader, a careful textual description of the painting, and a guide to its reading. He concludes each with a short note, typically concerning artistic attribution of the work. His choice is very broad: there are certainly many Mughal works, but all schools and styles appear well represented. End matter consists of a superb 17 page glossary, compiled by the editorial team for the first Indian edition, four pages of recommendations for further reading, and an index. This is maybe not the most extensive index in the world, and it might have been nice to have had a classified chronological index to the paintings, but (for once) there is a proper index. It would have been very helpful for many of the illustrations to have been larger, but that would have pushed the format up to ‘coffee table’ size, with a concomitant increase in price and reduction in portability. For most of the paintings this format is probably the best compromise, and ensures that you can read the book wherever you wish. 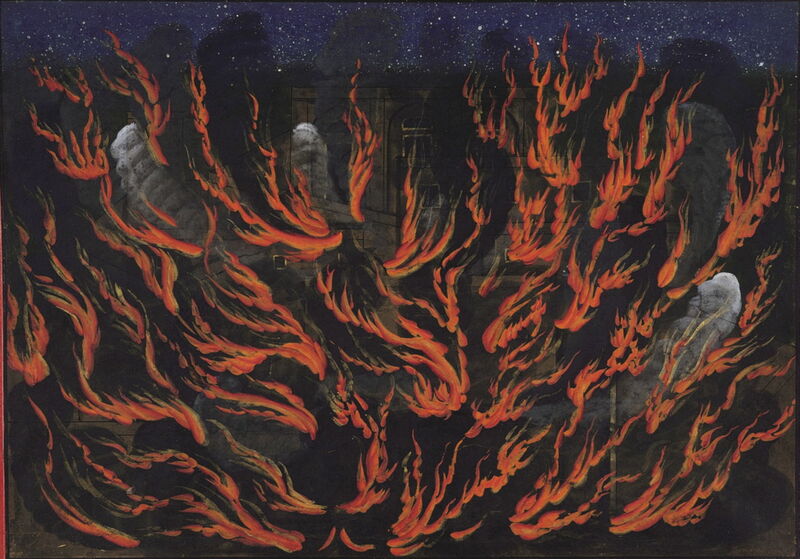 It might have been even better, perhaps, to have a website with high resolution images of the Great Works, but I understand the difficulties involved over rights to such images. B N Goswamy has written the perfect introduction to Indian painting, a difficult subject which he makes completely accessible and utterly absorbing. If you have even the slightest interest, buy it and I am sure that he will enthuse you for the subject. Posted in General, Painting and tagged India, Mughal, painting, review. Bookmark the permalink. While I am not fascinated specifically by the paintings from the Indian subcontinent, I do love to study art. Thank you for sharing!